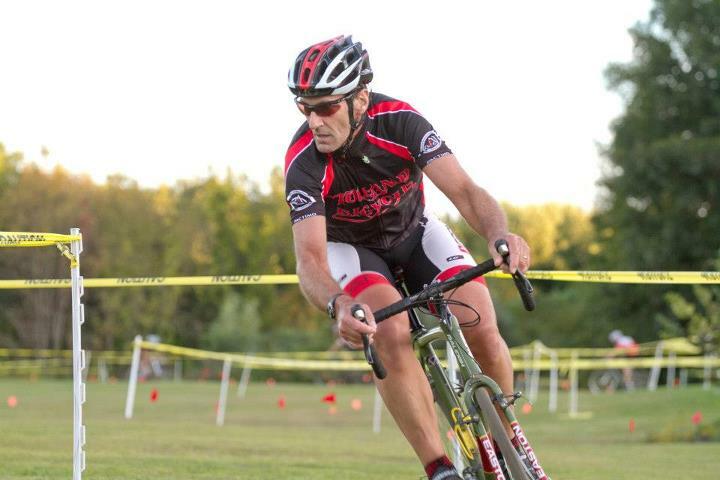 Check out the photo from RH cross last night-tell me the new kit doesn’t look MUCH faster!!! Did the 45 min A race. Not sure where I finished, but somewhere near 20-25 of 35 I think. Didn’t get lapped-yeehaw!! Got a good start, was about 15th midway through the first lap when I got taken down in a corner for the first crash of the night. Lost a few places & then got all tangled up in the course tape in the next corner. Settled into a pretty good rhythm. Avoided my middle of the race slow fade/meltdown. Battled with a few guys. With 2 to go I was with 2 guys and the guy in front of me bobbled in a 180 turn-I “overcorrected” and went down, threw my chain off the big ring, took a while to get it back on, 3 guys passed me. Managed to repass them within a half lap. One to go, another guy was right behind me, he passed me up the long hill, I repassed him in a technical section, he tried to repass me in a 180 turn at the bottom of the long hill with 1/4 lap to go-no dice, I held him off the rest of the way. 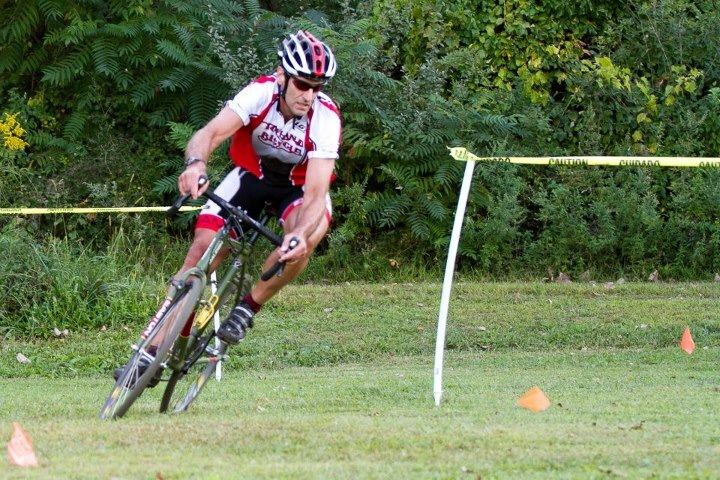 Felt good the whole race & was actually putting it to the pedals pretty good the last 2 laps. I decided to spend the summer of 2012 voluntarily “under-employed” as I transitioned from one job to another, in order to test the efficacy of my rigorous training regimen of consuming as much ice cream and beer as possible. Finally all my hard work and thousands of calories ingested were about to pay dividends. And no one would try to strip me of my Strava KOM’s if they discovered I’d been “doping”. Clearly bucket list-worthy. With or without EPO. I departed Thursday morning on an approximately 2-hour direct flight from BDL to CLT. Upon arrival, I rented a car and started the easy, scenic drive into the high country of North Carolina. It took about 1:45 to roll from Charlotte to Boone, where it was a comfortable 10 degrees cooler, and noticeably less humid, than the steamy city. On the way I passed through Blowing Rock, so I stopped in to check out this local attraction. I wandered the grounds for 10 minutes or so, and the expansive mountain views and geological formations were worth seeing. It’s not a very large area for exploring, so the $6 entrance fee might not seem worth it for everyone. But at least the gift shop is very prominently featured. Soon after arriving in the small college town of Boone, I stopped by a local joint called “The TApp Room”, situated directly across from Appalachian State University. There I enjoyed some tasty fish tacos and a side of fresh pico de gallo, paired with a nice “Seeing Double IPA” from Foothills Brewing Company (Winston-Salem, NC). Since it was only early afternoon and I had plenty of daylight remaining (and, notably, I was still sober-ish), I decided to head to nearby Boone Bicycle and Touring, where I’d reserved a rental bicycle for some local adventures. The shop is tucked away at the rear of a small, shared parking area, but its understated storefront belies the neatly organized and comprehensive operation within. I was promptly greeted and assisted by a staff member named Joseph, who was exceedingly helpful and accommodating. Within a few minutes I was checking over a Trek Madone 2.3 (2-series aluminum frame) in very good condition. The rental included a shop-provided seat bag with emergency repair kit (CO2 pump, spare tube, and tire levers). The bike was an ‘H2’ fit, size 54 cm, and some customization was in order. Joseph quickly mounted the pedals I’d brought from home, attached the bike to a trainer on the showroom floor, and had me saddle-up and soft-pedal while he made minor adjustments for fit. After about 5-6 minutes of efforts and a brief test-spin around the parking lot, I was pretty close to a solid working relationship with my new two-wheeled BFF. Joseph was kind enough to hand-write me a cue sheet for a local ride I could attack solo the following day. He also suggested a group ride going out from a nearby school that evening (there were no shortage of area social rides to choose from, any day of the week). Having picked up the bike on Thursday afternoon, Joseph told me that even if I returned the bike just after the store opened at 10 am on Sat, he’d only charge me for a 1-day rental ($59). It was clear from the shop and its customers whom I encountered during my brief time there that a rich but laid-back bicycling culture is collectively nurtured in this town. Originally I hadn’t planned to ride on Thursday, but I already had my bike all set up by mid-afternoon, and a friendly group ride seemed like a low-risk approach to an initial exploration of the local cycling scene. I joined the troop gathered on edge of the Pisgah and Cherokee National Forests at Valle Crucis Elementary School, which turns out to be the start/finish location for the annual “Blood Sweat and Gears” event, a century with 13,000+ ft of climbing. There was plenty of elevation gain during the first half of the ride, all the way up to the turning point at the Tennessee state line, where we paused to reassemble, collect stragglers, and catch our breath. As I was exploiting the rest opportunity to eat half a Clif bar, the ride leader called out “Where’s Doug? !”, knowing that I was the lone newbie Yankee of the bunch. After I responded with a full mouth, one of the women in the group turned to me and advised, in a considerable understatement, “We’re gonna pick up the pace a bit.” And with that, I witnessed the almost spontaneous formation of an orderly and efficient paceline, with regulars taking turns pulling at the front, as we dropped into the serpentine rollercoaster of the valley below, dancing with the shadows of the setting sun. After a long day of travel and riding, I was eager to remain faithful to my summer training regimen by gorging myself on some local grub and swill. I chose the Hob Nob Café, a farm-to-table local/organic/seasonal themed eatery with a very extensive and eclectic menu. I saw everything from Caribbean (Jamaica and Cuba), to Southeast USA, to Southeast Asia. I sat at the small bar bustling with wait staff activity and chose the “Goddess Salad” (go on—mock me if you must) with fresh spinach leaves, flavorful local cheese, house-made dressing, and including excellent hummus and thick slices of hearty toast as an accompaniment. I should have quit there but couldn’t help myself—I also ordered the Vietnamese pork sandwich, a panini-like feast with pork, ham, homemade slaw, chili aioli, hot peppers, and habanero sauce. Good thing nobody was sharing my hotel room. The sandwich also came with a side of roasted cut potatoes that were something like home fries, only better. I washed all this down with a Foothills Brewing Endo IPA, and a Bells Two Hearted IPA (Kalamazoo, MI). Oh yeah, and leave your credit card at home—Hob Nob is cash only. On Friday morning I set out relatively early to beat the predicted thunderstorms. I used Joseph’s reliable hand-written directions to wind my way out of town and climb to an entrance of the famed Blue Ridge Parkway. The route to the BRP was straightforward, scenic, and fun: quiet roads with plenty of climbing. Rolling along Shulls Mill Road in particular was a blast, and well worth the price of admission all by itself. The BRP turned out to be more bike-friendly than I had anticipated, with relatively low traffic volume, excellent pavement condition, a sedate speed limit of 35 mph in most areas, and the motorists seemed generally respectful. However, I was able to envision how cyclists could easily find themselves in trouble on this road, as it is a major thoroughfare for sightseeing autos, and the long hills provide ample opportunity for sustained high speeds on a bike (during one continuous downhill section of my BRP ride, I descended about 1000 feet in less than 6 miles). This subject is addressed in a recent book, “The Road Back” by Pulitzer Prize winner Michael Vitez (already on my “to-read” list). In 2008, University of Virginia student Matt Miller suffered life-threatening injuries when he collided his bicycle head-on into an oncoming vehicle on the BRP at high speed. Following his recovery, Mr. Miller competed in an Ironman triathlon, and is currently a medical student at University of Pennsylvania. The promised thunderstorms never arrived—in fact the weather was spectacular during my two days in Boone, with abundant sunshine, temperatures in the mid-80’s, and low humidity. The threat of severe conditions was a blessing in disguise—by midday Friday, my legs had no more miles remaining in the tank. I returned my rental Trek to the Boone bike shop and headed off for a late lunch. I checked out the Boone Saloon, where I tucked into a tasty homemade veggie burger with garlic yogurt sauce, served folded in naan, pita-style. I paired the food with a Foothills Brewing People’s Porter. Of course, immediately following lunch I had to decide where to eat dinner. Although I wanted to be adventurous and sample a different gastronomic venue on Friday night, I couldn’t resist returning to Hob Nob Café since the menu was so extensive. This time I picked a table in the popular outdoor seating area and tried the Thai bowl with chicken—spicy and flavorful with basil, lemongrass and rice noodles. The entire town of Boone has a funky, relaxed bohemian vibe…I could almost smell the incense and patchouli oil wafting the streets while strolling the main drag of intriguing shops and restaurants. On Saturday morning I departed for the conference in Charlotte, so I did not get a chance to attempt the infamous climb up Beech Mountain, which had been on my Boone to-do list. But that just gives me an excuse to make a return trip someday. On my ride towards downtown, which I would find warmer and wetter than up in the peaks, I contemplated this trip in a grander perspective. My travels over the past few years have afforded me the opportunity to ride in Colorado, Utah, central Ohio, Rolla MO, Miami, Morgantown WV, Seattle, Michigan, Alaska, Southern California, and Philadelphia PA. Boone ranks near the top of the list for my favorite bicycle memory to date. — Doug B.
Saturday Tolland Bicycle Shop Ride. 25 miles through the hills of Coventry. Weather started overcast but quickly became sunny and beautiful. Managed to get in a pretty good looking 6-man break in the middle of the race. Eiric Marro & I bridged up to Dave Kellog, one of his teammates, Frank Jenning as and 1 other guy. It looked like the pack was shutting down before we attacked and I figured we had a good chance since Kellog & Jennings teams (Arc en ciel and Spin arts, respectively) had the biggest teams. But we only stayed away for about 4 or 5 laps. Eiric told me after the race that he was suprised I pulled through when we bridged up-man what a bad rap. Randy Rusk rolled off the front with about 6 laps to go and Arc en Ciel shut it down. Tommy Stevens and Mark Thompson got away and so then Spin arts was blocking for Tom as well. The pace really slowed and it got even sketchier. I had hoped to get a better result, but I’m pleased with the day. Probably the best race I’ve had at Ninnygrit in a long time. 2 weeks riding with the 1-2-3s at the Rent has done wonders for my fitness. This was a short ride 20 miles, headed out Buff Cap to Route 140, through Stafford, back along Route 32.